Judith Nadler begins her post as Director of the University Library on Friday, Oct. 1. Richard Saller, Provost of the University, said, “I am delighted that Judith Nadler has accepted the appointment as Director of the University Library. The Library is among our most precious resources on campus, and no one is better able to preserve and develop it than Judi, who will bring energy, deep experience and devotion to the job. “Martin has been the tireless advocate for this precious resource over more than two decades, developing the Library’s extraordinary collections and maintaining its reputation as one of the most user-friendly research libraries in the world,” said Saller. Nadler’s extensive history at the University began with her work as a cataloger in the Foreign Language Section of the Library’s Cataloging Department. She was successively promoted to Head of the Social Sciences Section, Head of the Cataloging Department, Assistant Director for Technical Services and then Associate Director of the Library. She also currently serves as chief selector for the Library’s Judaica Collection, having raised much of the funding to build this collection. Describing the many initiatives she has spearheaded here, Runkle wrote that, “As a recent example, in 2000, Judith orchestrated the creation of the Information Resources Management Division. This new division brought together all activities providing the infrastructure for acquiring, maintaining and accessing the Library’s collections in all formats, whether held locally or accessed via the Internet from remote locations. “Today, the Information Resources Management Division, with more than 100 full-time-equivalent positions, supports and facilitates a wide range of activities, including digitization and instructional media projects, throughout the Library system and on campus,” Runkle noted. Currently, Nadler is guiding the Library’s strategic planning process and formulating its plans for creating and archiving digital information resources. 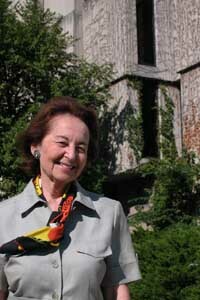 Nadler studied history and comparative linguistics at the University of Cluj in Romania, earned an undergraduate degree in English and romance studies from the Hebrew University of Jerusalem, a master’s degree in library science from the Israel Graduate School, and she pursued graduate studies in comparative literature at Hebrew University.